There is no denying that Middle-earth can be a cold place, but so too can the real world have its frigid temperatures. 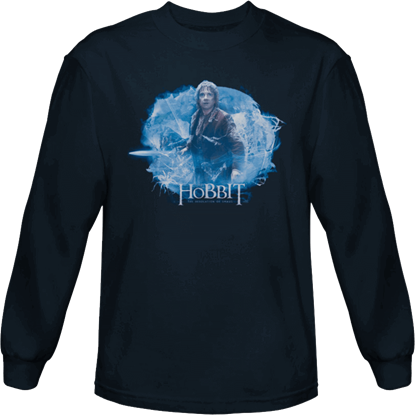 Now, though, you can keep warm in style while featuring some of your favorite characters from the book that introduced the world to the lands of Middle-earth with our The Hobbit long sleeved shirts! Many of these shirts are made from 100 percent high quality cotton, which ensures that they are not only stylish to look at but also quite nice to wear! 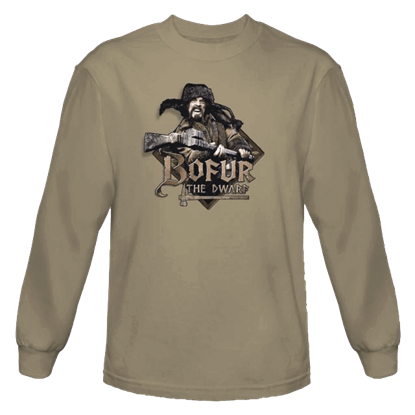 The long sleeves serve to perfectly keep you warm and snug against the chill of fall and winter, while the impressive designs are sure to attract attention and show off how much you love The Hobbit novel and films. The designs vary in style, ranging from close-ups to single characters to stunning displays that show off Thorins Company of Dwarves, the infamous trio of trolls, the goblins of the Misty Mountains, and so much more! Some even show off the dread dragon Smaug, the great antagonist who claimed the Lonely Mountain as his own! These shirts are an absolute blast to wear when it comes to showing off your love of this classic story. If you love J.R.R. 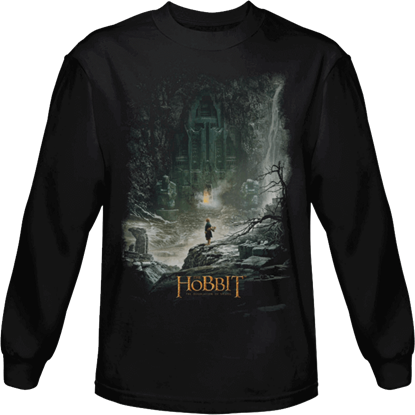 Tolkiens The Hobbit and are in the market for a new shirt that will keep you warm this winter, then you are in luck, because we have just the garments that you are looking for right here in our selection of The Hobbit long sleeved shirts! 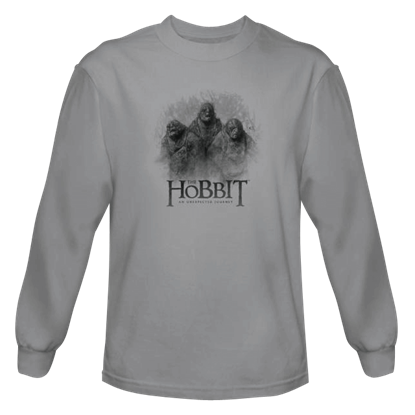 Printed on the gray material of this 3 Trolls Long Sleeved T-Shirt appears a graphic from The Hobbit An Unexpected Journey film, showing the iconic trio of lumbering trolls named Tom, Bert, and William. Mirkwood may be the realm of the elven King Thranduil, but it is also the domain of things far more sinister. 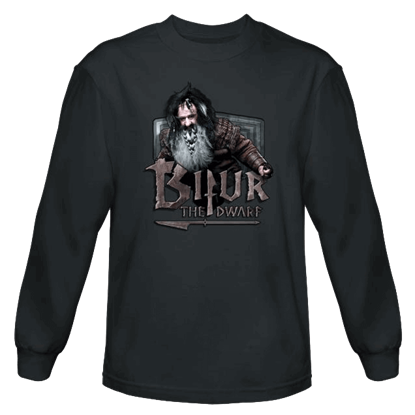 Dol Goldur lies just nearby, and, as the A Tangled Web Hobbit Long Sleeve T-Shirt implies, spiders call Mirkwood their home. Bilbo has come a long way from home, and in the Desolation of Smaug, he will go even further. The At Smaugs Door Long Sleeve Shirt depicts a pivotal moment when the hobbit must summon every ounce of courage to face a dragon. One of the most memorable scenes from The Hobbit is when the dwarves escaped Mirkwood via barrel and river. 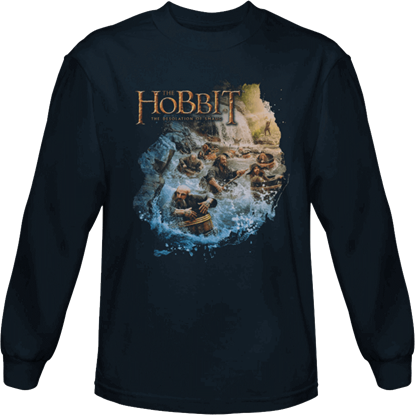 The Barreling Down Hobbit Long Sleeved T-Shirt captures that moment from the movie, making for a fun shirt for any fan to wear! The mighty company of 13 dwarves that set off across Middle Earth to reclaim the Lonely Mountain in The Hobbit included Bifur, seen here as he appears in the graphic from the movie, The Hobbit An Unexpected Journey. Bilbo Baggins is the unlikely hero of J.R.R. Tolkiens literary masterpiece, The Hobbit. The Hobbit An Unexpected Journey is the first film in The Lord of the Rings director Peter Jacksons cinematic telling of the classic tale. In the Hobbit, Bilbo Baggins lived a quaint, quiet life in The Shire until Gandalf the Wizard and 13 dwarves persuaded him to join them on an adventure. 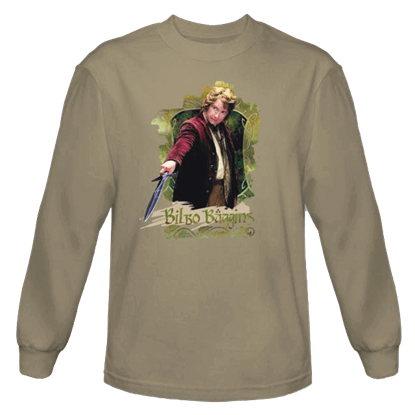 The Bilbo Poster Long Sleeved T-Shirtmakes a great choice for fans of the film. Bilbo Baggins is the unlikely burglar chosen by Gandalf to aid the dwarves on their raid of the Lonely Mountain in The Hobbit. 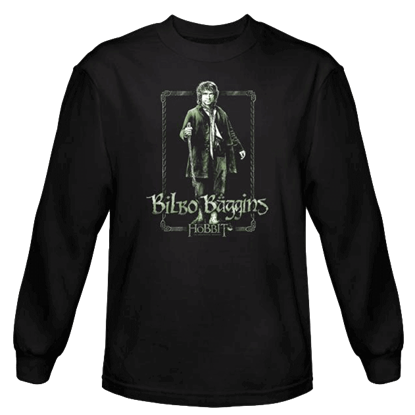 A graphic of Bilbo appears on this black, Long Sleeved T-Shirt in the earthen tones of the Shire. The Hobbit An Unexpected Journey is the first part of Peter Jacksons masterful film adaptation of J.R.R. Tolkiens epic novel, The Hobbit. 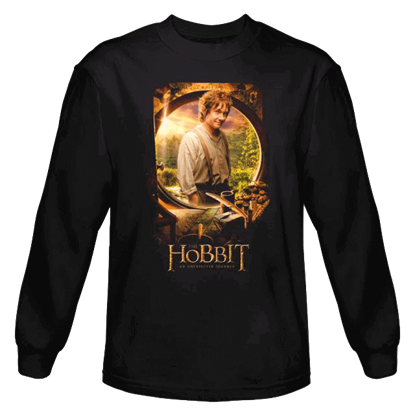 The Black Hobbit Logo Long Sleeved T-Shirt makes a great choice for fans of the movies. Laketown is a picturesque place. 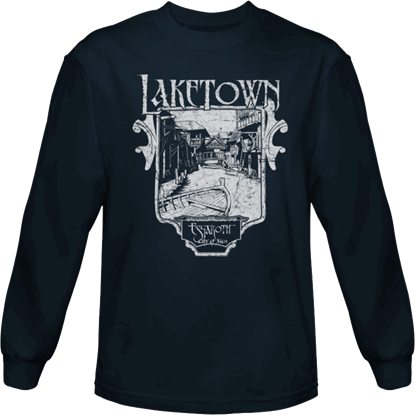 Showing a sketch-like graphic, this Blue Laketown Long Sleeve Shirt offers a glimpse of the town of Esgaroth, which was built on a lake to help protect it if the dragon Smaug ever try to attack. In The Hobbit, the classic tale from J.R.R. Tolkien, Bofur, along with his brother Bombur and cousin Bifur, were companions of Bilbo Baggins and Thorin Oakenshield on their quest to reclaim the Lonely Mountain. 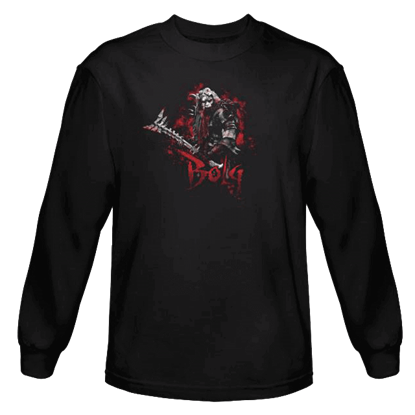 Bolg, shown in the graphic on this Long Sleeved T-Shirt from The Hobbit An Unexpected Journey, ruled the northern orcs for about 150 years and led the army of goblins, Wargs, and Bats in the Battle of the Five Armies.